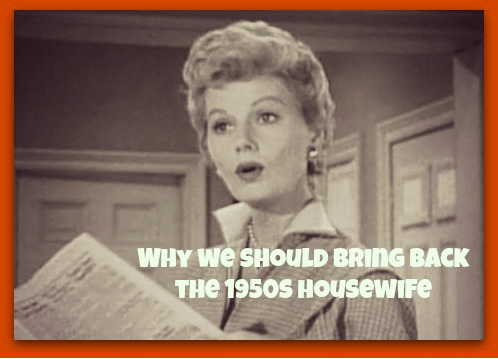 There is always talk among the mothering community about the 1950s, June Cleaver, stereotypical housewife. We’re not sure if we want to revert back or not. I’ve read books telling us we should always put on make-up and freshen ourselves up before our husband gets home (which by the way I do try to do at least 50% of the time, notsomuch in the winter when I’m in leggings and Uggs all day) but I’ve also read books and blogs telling us to throw that off and embrace this age and what works for our family. So what’s the one 1950s lifestyle change that I believe is wrecking havoc on us as women? No longer wearing skirts with heels to the grocery store? No. No longer ideally having a hot meal ready when our husband walks through the door? No. No longer having husbands in charge of the finances? No. I believe the number one thing we need to bring back from the 1950s lifestyle was a sense of community. As a history major in college, I’ve always enjoyed asking older folks about their life in the “old days.” I’m always intrigued about how motherhood and routines were before iPads and basketball games took over the American Dream. I spend a lot of time with my neighbor lady that is 81 (surprise, surprise, we are the only ones on the street that are home ALL day). I asked her awhile back how she got things done as a young mom with 2 little ones. She said that her and her sister both had kids around the same time so they would visit each other and the kids would play together and then either she would help her sister or her sister would help her. Wow. Mind blown. I can’t imagine us, in all of our 2015 wealth of knowledge, ever really doing this. Or if we did it would go more like this: I send facebook message to my sister asking if she wants to get together. We pick a date 2-3 weeks out when we don’t have story time, basketball games, workshop on food GMOs. When the day comes we pack up children and get together. We spend 3 hours together. 1 of those is spent catching up. 1 hour is spent working. And the other hour is spent responding to texts/facebook messages or checking newsfeeds on Instagram. The kids are entertained by a countless assortment of games on their Xbox 360 or iPad. That scenario is probably a little extreme. But it is convicting even for me (and I wrote it)! Ha. I realize as a busy mom of three little ones that sometimes the only way to keep in touch with my closest, and vent the issue of the day, is to send a quick text off. I get that! However, what we have done as a society is put our children’s activities, happiness, and even our own lack of feeling social- ahead of being a community! Spending time with neighbors and friends! Taking time to talk to a widow or encourage a new mom. We hide behind our screens and we hide inside our houses! How much could we achieve if we found a friend that we loved and our kids played well together and we traded a day twice a month to help each other. Or are we too prideful? I know I may be at first. Clean the house before they even come over! One of my goals for 2015 is to spend two days a month in community! That sounds pretty weak- but at least 2 days a month either invite a friend over for a playdate, or host a party, or visit someone I haven’t seen in awhile. An old friend. My grandma. I know a lot of you are already doing this. Or maybe you’ve gotten too busy following Jr. around to even realize that you weren’t living intentionally with others. What do you think? Do you live in community? Do you have a few close sisters that you could call to help you out or vice versa? Let’s do it! 🙂 We love to read! Get yourself to a bible based church. You’ll get a social life. I’m single yet I find fellowship by bbsiting for others in the church it releases mums and dads to go visit other friends each week and build relationships. It builds family like relationships for me too and healthy relationships for kids to get to know others in church. Security by knowing your neighbors. Its great all round.